Updated for the third time, this revised edition covers new developments in addition to best practice in midwifery from conception and antenatal support through to labour and postnatal care. The journey for the mother and baby from conception to birth and after is portrayed in an easy to read and user-friendly style. The text is divided into seven main sections, which include normal and complicated labour, postnatal care, contraception, care of the newborn and infant feeding. Each section is divided into chapters and bite-size pieces of information, which include assessment, diagnosis, management and treatment interventions. Each section is clear and easy to understand. The authors have made excellent use of tables, flow charts and diagrams which are clear, well-presented and will aid understanding. The content is particularly useful on positioning and attachment, breastfeeding and feeding in special circumstances, multiple birth or mother and baby separation. It is easy to dip into and is packed with information, though the writing style doesn’t resemble a text book, more a companion. 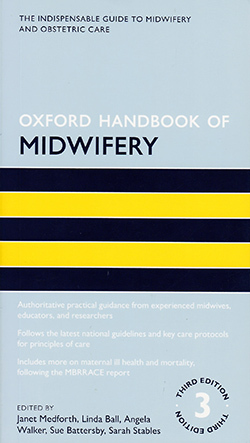 This concise, pocket-sized text is an excellent resource for student midwives, those looking to refresh their knowledge and skills, educators and neonatal staff who are looking to enhance their knowledge of maternity care.